Being Human was first played on BBC3 in the new year of 2009 and I began watching shortly after. It has just this past Sunday the 13th, finished its third series run in the UK (there were tears, but it was worth it). It was created by Toby Whithouse, known for writing episodes for shows such as Torchwood and Doctor Who. 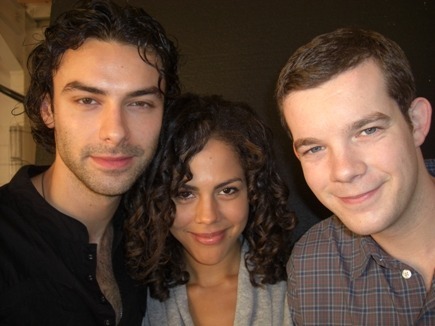 The three lead actors are Aidan Turner (John Mitchell), Russell Tovey (George Sands) and Lenora Crichlow (Annie Sawyer). As the series progresses more main characters are added, but the original three are at the show’s heart. I discovered this show via suggestion from a Doctor Who fan in Britain (yup I’m amping up my geek cred here), who suggested that if I liked Doctor Who, this may be right up my alley. Being Human is a dramedy and not for the faint of heart, but the humour is hilarious, the drama is so intense I sometimes find myself holding my breath, and the friendship that these unlikely characters form is beautiful. Now even if you watch the North American version you should know that the writers for that version have only watched the first series of the original and most of the actors have only watched the first episode. It is a different show, and will go along a different plotline at some point – this should be respected. I won’t say much more about this version because I’m here to discuss the original, and quite frankly, I don’t want to waste the time and effort it would take to move my fingers over the keys to discuss it at length. If you like it, please enjoy, but many who saw the original first are cringing, or laughing…or crying. The character dynamic isn’t the same, and quite honestly, as soon as they mentioned Twilight, I was done. So without giving away any spoilers, what is Being Human about? Let’s have a brief character breakdown. John Mitchell (usually just referred to as Mitchell), born in 1893 was bitten by a vampire, William Herrick, in a deal to save his men during WWI. He works, with George as a hospital porter (orderly, janitor) in order to keep a low profile. He does not drink blood (or tries his damn hardest not to) because of his ugly and bloody past. This may sound Twilightish – it isn’t, it really, really isn’t, because if it were, I wouldn’t be watching it. Vampires can go out into the sunlight in this series, but like traditional vampires, they cannot be seen through mirrors or cameras. The vampires are all very well connected, and have seemingly infiltrated every powerful occupation in this series. They cover for each other and plan in secret for a world take over. While Mitchell’s past is shady and it is apparent from the beginning that he wasn’t always one of the good guys, he now distances himself from his fellow vamps. Despite this, throughout the series Herrick (the head honcho) still tries to tempt Mitchell back to his side just like the good old days. Mitchell, despite the equal billing of all three main characters, is arguably the main character of the show. It only makes sense really; he is the oldest and therefore has a long and dark back-story. He must constantly fight what he is, and ultimately fail at points. Much of what happens in the series is a direct result of Mitchell’s actions. Mitchell is very dependent on his two flat mates and they are vital to his human-ish existence. George has an incredibly high IQ and speaks six languages but also works as a hospital porter in order to avoid attention. He was scratched by a werewolf while out walking one night in Scotland. He is often the comic relief of the series as he can be very panicky, sarcastic, and rather socially awkward but with a heart of gold. He is Jewish and wears a Star of David around his neck, which Mitchell looks after when he transforms into a werewolf. George, unlike Mitchell or Annie, is able to remain in denial of what he is because he is for all but one night of the month, still human. George wants to be loved, and desperately wants to stop running. Their house in Bristol is what he sees as his best chance to stay somewhere long term. Annie Sawyer was 22 years old when she died. She lived in the house that Mitchell and George later rent out. She fell down the stairs and cracked her head open on the tile floor and has been haunting the house ever since. Supernatural beings can see other supernatural beings in this series so while certain circumstances in the series either allow or disallow humans to see Annie, Mitchell and George can always see, and touch her. Annie is able to transport herself from room to room and pick up everyday items. She cannot eat or drink, but is known throughout the series for making tea, whether it is needed, or drunk or not – in order to keep routine. Annie believes that her unfinished business, and therefore her reason for being a ghost must have something to do with her ex-fiancé, Owen and attempts to determine how to cross over. She is the sweetest and least tainted character of the series and is also used for comic relief, but with a devastating story of her own. As the characters negotiate their way through their lives, professional, personal and social, attempting to be quiet and unassuming they soon find that as much as they try, being human is far more difficult than they originally hoped. I have to say that while I believe that this is one of the best shows to come to television in years, it isn’t PG, not even close. The language is exactly what would be used by 20-something year olds and is quite gritty. I actually quite enjoy the realism and while some might suggest that the swearing isn’t needed Who finds out that they live with a ghost and just says “well golly gee!”? The content of some episodes is quite difficult to watch at times, and while necessary to the plot, it probably isn’t for everyone. Characters are mortal and blood is shed, often in an uncomfortable and morally ambiguous fashion (children are not exempt from this rule) – with vampires and werewolves it seems silly to think otherwise, but it should be said. The moral ambiguity of much of the series, while uncomfortable, does push the plot and the characters further. People do bad things, human or otherwise – everyone has their faults. Being Human has a very strong, well acted and written group of characters. The inner struggles of the characters and the struggles within the household seem very real, to the viewer. The antagonists are charming and quite funny as well, without becoming farcical. And thank the lord! We are given antagonists that, while we may despise them, are not straight up and down evil. They have fairly understandable reasons for the actions they take, even if we wish that they would stop. Despite the darkness, there is warmth to the series that I love. These people are all lost in some way and manage to find each other and form possibly the most bizarre family there could be – and it works! We all know going in that they won’t be able to live perfectly as humans, they are monsters. The show does present an interesting dilemma though– if they just want to live in peace in their little house, like a little family, and humans outside are the ones trying to take them down – who are the real monsters? Maybe, as the series suggests, it is impossible to be human, or perhaps even, human is not what is always “good”. Series 1 and 2 played on Space last year but has currently been replaced by the North American remake. Series 1 is 6 episodes long and then because of its success, the following series have all been bumped up to 8 episodes. Series 1 and 2 are available on DVD in Canada now and Series 3 will probably be available anytime between the summer and Christmas. Good news for Being Human fans! Series 4 as of March 14th, 2011 has been signed for another series! Series 1: 9/10 – because I felt like I should give a number anyway. I highly, highly recommend this show. Should you be interested, here is the BBC America trailer for Series 1. Comments for Brit Picks: “Being Human” are now closed.